We’re down to the final five. 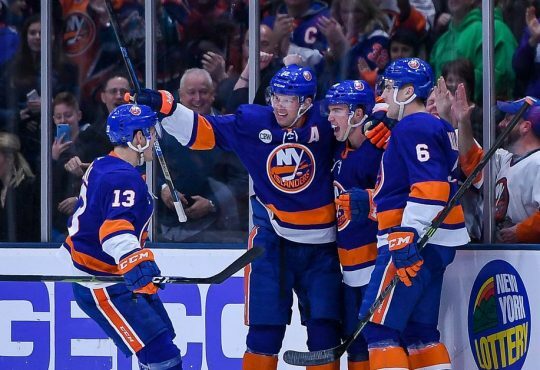 That’s right, starting this evening in Winnipeg, the New York Islanders will embark on the last five games of the 2018-19 season. A spot in the postseason is just about claimed, but there’s still a lot on the line for the team — a chance at winning the Metro, home ice in the first round and playoff seeding. Even after being shut out for the third time in five games on Tuesday night, the Isles still have a reasonable amount of time to get themselves right for the postseason which begins two weeks from yesterday. Until the end of the season, our Rob Taub every Thursday will give his observations on what has stood out to him. All observations come from the perspective of things that happened in previous games, weeks, or have been a season-long trend. 1. The small margin for error. For the entire year, we’ve watched the Islanders win and they did it playing near perfect hockey. Why that is, is when they have made the slightest of mistakes, the walls come down. 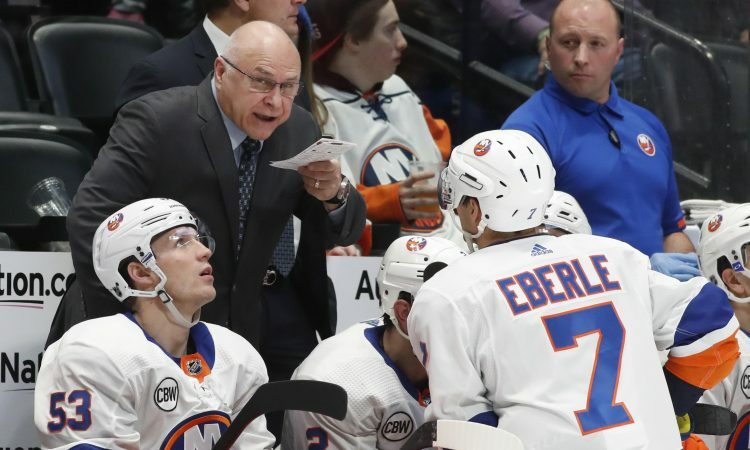 In three of the Isles last three losses, it’s been mistakes that have put the game out of reach before they can compose themselves to push back. Tuesday night it was a rough too many men call that resulted in the game-winning goal early in the contest; Last Thursday against Montreal it was an awful penalty taken by forward Leo Komarov in the final minute of the first period, resulting in the Habs the to score with under ten seconds left; Against Boston, it was a failed clearing attempt up the boards by d-man Nick Leddy that ended with Sean Kuraly scoring 1:12 into the game, setting the tone for a 5-0 blowout loss. Because the Islanders lack skill at the forward position, making next to no mistakes is how they will continue to be successful. They’ve shown they can play that error-free game and frustrate the opposition. In the playoffs, mistakes are magnified times ten. That’s something the Isles need to get right or they will find themselves in deep trouble. 2. The Johnny Boychuk effect. Simply put, the Islanders are just simply better when #55 is on the ice. This season overall has been a renaissance for the 35-year old. But this past weekend exhibited truly how valuable Boychuk is to the current roster. Boychuk immediately contributed after finally returning from suffering an injury at the hands of Flyers forward Jakub Voracek on March 9. 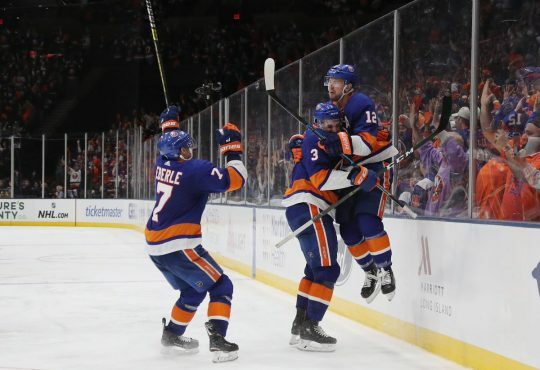 He had two assists — one on the Islanders second goal Saturday and on Jordan Eberle’s game-winner Sunday — and was shooting from everywhere. 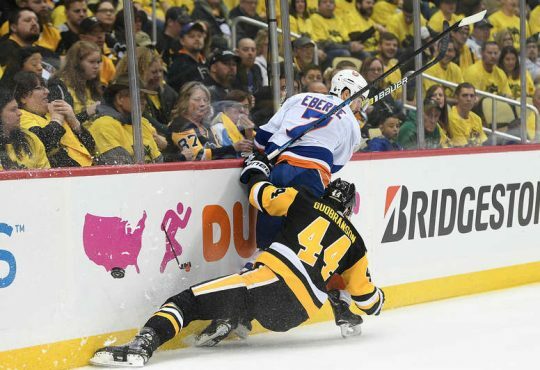 Boychuk also recorded seven blocked shots in the two games, showing he was willing to put his body on the line for the better of the team even after being sidelined for six games. 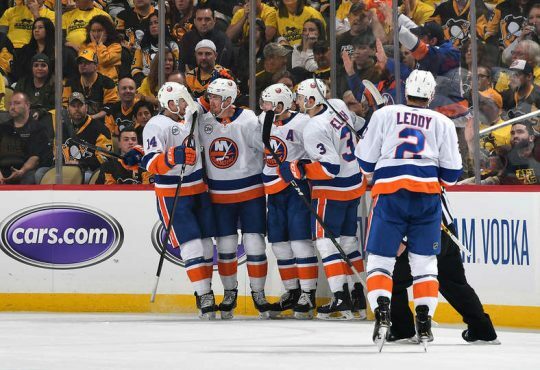 Having a healthy Boychuk, no question is one of the underlying element as to why the Isles are on the cusp of earning its first postseason birth in three seasons. 3. Josh Bailey is clutch no matter how much you hate it. Ah, the one player that no matter when his name gets mentioned is a conversation starter. But there’s no denying Bailey — even when he’s struggled — still finds a way to turn heads. Saturday afternoon was the latest example. In a game his team had to have, Bailey, scored the game-winning goal late in regulation and added a much-needed insurance goal to ensure a victory. But even Saturday doesn’t reflect just how important the 29-year old has come up in so many situations this season. Opening night in Carolina he notched the game-winner in overtime; He scored the first goal in the Isles comeback 6-3 win against Ottawa in late December; His goal late in regulation in early January stole the Isles a win at Madison Square Garden; His game-winning tally in Washington earned the team first place in the Metro. So there you have it. Bailey might not be a 20-goal scorer and still struggles at times, but he comes up big when the Islanders need it the most. 4. We need to see more of Nick Leddy’s end-to-end rushes. We’re so used to seeing the offensive mindset from Leddy since he became an Islander, but it’s been different this season. And rightfully so. Head coach Barry Trotz asked his team to sacrifice offense for defense and they’ve obliged. But there have still been times when we’ve seen Leddy in particular turn it on. Those end-to-end rushes are peak him. He’s done it in spurts this year and they’ve produced good results. Leddy trying to do it more often could help the offense. With the lack of skill the Isles have in the lineup, allowing Leddy to go end-to-end if the ice opens up is worth the risk. 5. Ranking the most improved players one to five. Since the season is down to its final weeks, this topic has definitely sparked debate. There are many ways to go about making an argument for all the names involved. We can go on for days about the phenomenal turnaround for goaltender Thomas Greiss; His partner, Robin Lehner — despite not being on the Islanders last year — experiencing a career resurgence after revealing in training camp his past issues with addiction and mental health issues; Brock Nelson going from maligned forward to a bonafide number two center and 50-point scorer; Scott Mayfield and Adam Pelech’s ascension as solid defensemen in the league. But if I had to make my own list, it’s 1) Greiss, 2) Nelson, 3) Pelech, 4) Lehner, 5) Mayfield. By this time next Sunday, it will still be up for debate. 6. Michael Dal Colle’s time to shine. As unfortunate as Andrew Ladd’s injury is, it gives Dal Colle his shot to prove he can be a difference maker on this team these last few games, playoffs and into next season. At such a crucial time, Dal Colle’s presence was being called for by the fan base, and for good reason. In his second stint with the varsity this year, Dal Colle looked fantastic in an elevated role and showed he belonged. The Islanders are still searching for offense and Dal Colle could be that spark. His underrated shot is there, but it’s his size and skill — two things the forward corps lacks — that can help drive the attack. 7. Casey Cizikas needs to hit that 20-goal mark. Cizikas scoring an unprecedented 19 goals this season was something nobody saw coming. But it would really stink if he wasn’t able to get to that elusive 20. He deserves it for how much he’s done to help the Islanders get back to the postseason. And if he does get to 20, it just goes to show that when he signed that contract a few years back it was all worth it no matter how many people questioned the organization’s thinking. 8. The sad state of Andrew Ladd. Advocating for Ladd since he’s donned the blue and orange has been a challenge, but this latest setback just proves that he’s not the player he once was. I thought him coming back in the lineup would be a major boost because of his veteran leadership and winning mentality (he’s a two-time Cup champion). Now he’s out again — suffering an ACL injury — which again signifies that the body just isn’t there anymore even if with the right mindset. It’s unfortunate how Ladd’s tenure has gone — the albatross of a contract and little production — but hopefully, there’s some light at the end of the tunnel. 9. Barzal needs to start ripping it and now. After the games he had against Detroit and Minnesota, I thought that Barzal was finally out of his funk. I did that without realizing after Tuesday’s game that he hasn’t scored in 19 games. Goals are one thing, but not shooting the puck is another. In four of his last five games, Barzal hasn’t recorded a shot but has had multiple good opportunities. There’s no doubt the reigning Calder winner is a pass-first guy, but once in a while he needs to be selfish. Barzal has displayed on a few occasions this season that he actually does have a good shot. He needs to start using it. It’s only going to make him a better player. Not to mention, it can probably help his team who’s been offensively challenged all year. 10. Appreciation for Tanner Fritz. Isles fans have seen Fritz before in recent years, but not to a point where they know what he brings to the table. What he did on Sunday — killing off almost a minute of the Coyotes power play on his own — was just the first taste of what the former Ohio State Buckeye can do. The fans definitely appreciated it, as did the captain and Barry Trotz. If that was just the start of how Fritz is going to play in these last few games, the Islanders might have a sleeper on their hands. “He’s one of those young men you meet [who] is doing everything he can to be the best he can,” Trotz said about Fritz to the New York Post. BONUS*: Congrats goes out to Robin Lehner on being nominated as the Islanders nominee for the Bill Masterton Memorial Trophy. The award represents “perseverance and dedication to the sport of hockey” and that’s exactly what Lehner has done for himself and his team all year. Lehner winning the award should be a no-brainer.